Paraguay’s government pledges to crack down on illegal deforestation as new map reveals extent of damage being done to Gran Chaco, wrecking ancient forests and threatening survival of indigenous groups. 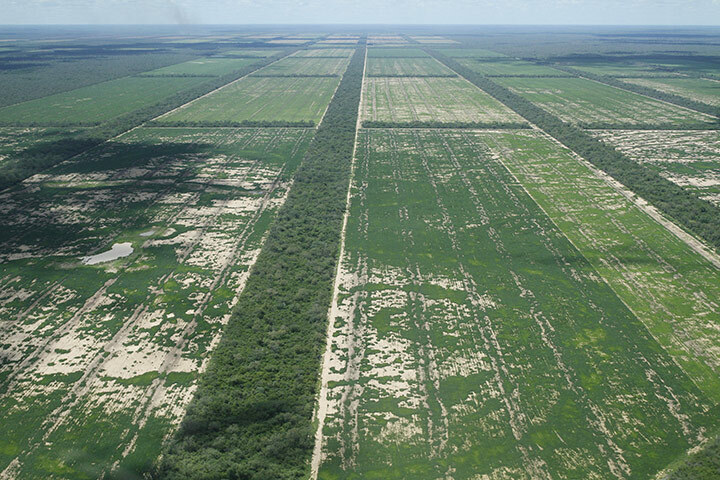 Tracts of land where Gran Chaco forest has been cleared to make way for soy plantations. Photo courtesy of Friends of the Earth via the Guardian. The government of conservative President Horacio Cartes has been forced to reiterate its commitment to enforcing the law on deforestation and crack down on illegal logging, after a new map carried out as part of research by the Environment Ministry (SEAM) was launched revealing the true extent of tree loss across the country. SEAM’s first Mapa de la Deforestación (Deforestation Map), released at the end of August, showed that in just six months from August 2013 to January 2014 more than 143,000 hectares (1,430km²) of forest was lost in Paraguay, with the bulk of this loss – 117,891 hectares, or 785 a day – occurring in the western half of the country, where the Gran Chaco is found. The aim of the new Deforestation Map, which uses satellite images to pinpoint the parts of the countryside that are being deforested, is to help authorities identify and intervene in illegal deforestation activities, which are often carried out by clandestine loggers or multinational ranching companies who want to clear land for cattle pasture. The Map was launched at the same time as an accompanying programme, known as Operativo Taguató Ruvicha, a conservation effort named after the local Guaraní word for the endangered harpy eagle, which will see SEAM team up with other national organisations and authorities to present a unified front against deforestation, while working to recover and restore land that has already been degraded through deforestation. Despite the fact that the eastern half of Paraguay saw a much lower rate of forest loss than in the west, with a total of 25,765 hectares over the period (171 a day), there was still some disappointment on the part of SEAM given that this region has technically been covered by a Zero Deforestation Law since 2004. While the implementation of this law has brought down deforestation rates by as much as 90%, according to the Paraguayan division of the World Wide Fund for Nature (WWF), it has still not managed to completely stamp out illegal logging and clearing of land, and the western half of the country continues to lack similar appropriate legislation. 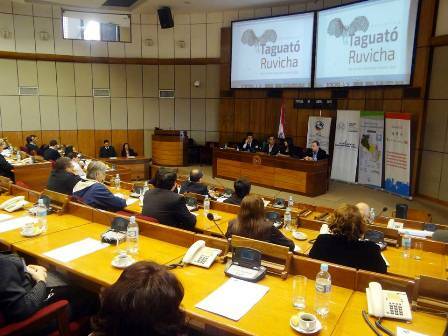 Paraguayan officials at the launch of Operativo Taguató Ruvicha, at the Environment Ministry (SEAM). Photo courtesy of SEAM. Paraguay went from having more than 9m hectares (90,000km²) of land covered by forest in 1950, to just 1.3m hectares (13,000km²) in 2004, at which point it had the highest deforestation rate in Latin America and the second highest rate in the world. Earlier this year, a study by the University of Maryland revealed that the Paraguayan portion of the Gran Chaco – which is Latin America’s second largest forest after the Amazon and also stretches over parts of southern Bolivia and northern Argentina – was suffering the highest rate of deforestation in the world. An in-depth report by Rolling Stone, meanwhile, told of the extent of deforestation at the hands of giant agricultural companies clearing land to make way for massive single-use estates – often either pasture for cattle or plantations of soya beans destined for cattle feed. Aside from the ecological consequences of deforestation on such a massive scale, from land and soil degradation to higher carbon emissions from the change of land use and loss of forest cover that would serve to soak up and store atmospheric carbon dioxide, the brutal clearing of Paraguay’s countryside – especially in the Chaco – has another sinister side-effect. The Gran Chaco is still home to numerous indigenous communities, who often find their ancestral territories threatened by multinational logging and ranching companies eager to buy up their land. 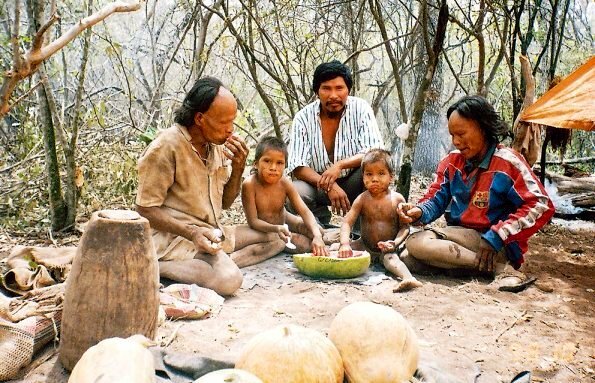 One of these groups is the Ayoreo, some of whose members are still in isolation from mainstream society – the last known case of this happening in the Americas outside of the Amazon rainforest. Earlier this month Ayoreo tribe leaders appeared in the Paraguayan Senate to demand government action against a Brazilian ranching company, Yaguarete Pora, which they say is carrying out extensive logging in Ayoreo territory, even though it doesn’t have a proper legal licence to do so. The Ayoreo claim that the extent of this deforestation has now reached some 1,200 hectares in just over three weeks, despite the fact that a Paraguayan tribunal had previously revoked the company’s environmental licence. Members of the Ayoreo indigenous group, from the Gran Chaco, whose livelihoods are being threatened by logging and ranching companies. Photo courtesy of ABC Color. SEAM and its allies among Paraguayan authorities are promising that the launch of Operativo Taguató Ruvicha heralds a new regime where illegal loggers will be pursued and punished, without exception, facing hefty fines and ‘administrative’ sanctions if they fail to meet environmental standards, according to a communiqué on SEAM’s website. However, in the ongoing case between the Ayoreo and Yaguarete Pora, which has intensified since the launching of the Deforestation Map and Operativo Taguató Ruvicha, there have been allegations that authorities have been slow to respond to the indigenous representatives’ claims. Part of the problem stems from the fact that the Ayoreo have not been granted proper titling of their lands, which led to the government claiming last week that it doesn’t have the power to prevent Yaguarete Pora from continuing with its logging works, given that it has already revoked its licence. Supporters of the Ayoreo, including several senators from the centre-left Liberal Party and the Spanish news agency Efe, have also claimed that SEAM has been slow and non-committal in its responses to requests for comment and information. It also claimed to Efe that the company’s licence had been awarded before the current Cartes administration, although Efe pointed out that it had been renewed since then. The risk is that the new stated approach by the government to pursue illegal loggers will prove to suffer from the same lack of fulfilment that appears to be plaguing the application of justice for the Ayoreo, just as the Zero Deforestation Law has failed to go as far as it was perhaps intended, in that it has reduced but not eliminated deforestation in one part of the country while not changing much at all in the other half. Of course, it is still too early to say that the government’s new Deforestation Map service and Operativo Taguató Ruvicha will be ineffective, and hopefully they will help to bring illegal and clandestine deforestation in Paraguay under a degree of control. Yet a gaffe by President Cartes earlier this year, when he told attendees at a meeting of 180 Brazilian business leaders and potential investors to “use and abuse” Paraguay, was a painful reminder that his government is likely to favour economic interests over those of the environment and local inhabitants. Are Latin America’s oil-producing countries shirking their responsibilities on climate change?